Is there a U.S. murder wave? Killings have surged in numerous U.S. cities, according to reports from several news outlets, which have have reported on a supposed national trend. 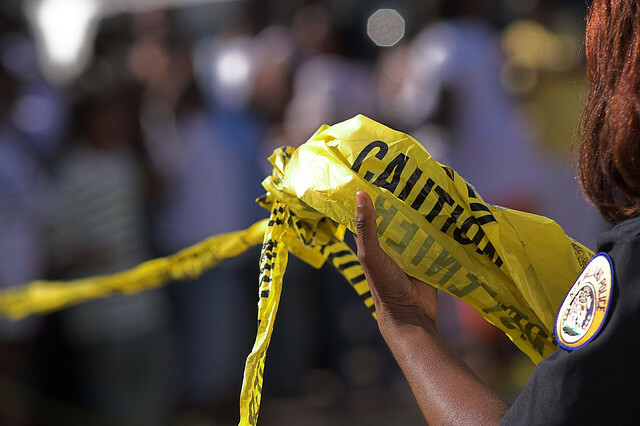 Baltimore, St. Louis, Washington, D.C., New Orleans and others have seen increased bloodshed. But a new report from the Brennan Center for Justice shows that many cities have seen fewer killings. Others saw homicides spike, while increases in some cities seem to fit typical fluctuations between years, according to the report, which was released Wednesday. The report rebukes the idea that there's a nationwide increase in crime. But more than that, it pushes against the broader narrative that criticisms of police use of force over the past year — driven by the Black Lives Matter movement — are demoralizing police officers and emboldening criminals, leading to more crime. After all, if a nationwide movement really were leading to more crime, one would expect to see it in the numbers. But the data, in fact, shows the opposite. The Brennan Center, which is based at the New York University School of Law, obtained preliminary crime stats from 25 police departments out of the nation’s 30 largest cities. Some homicide rates went up, some went down. What’s clear, the report says, is that there is no murder wave, and no nationwide increase in violent crime. So, while Denver is projected to have a startling 75 percent increase in homicides from last year (from 31 to an estimated 54 deaths), Boston is forecast to have a 32 percent decrease (from 53 to 36 projected deaths), according to the report. In all, 11 of the cities surveyed are expected to have decreases this year, including Detroit, Memphis and Philadelphia. Fourteen of the 30 largest cities are expected to have increases. This excludes five cities whose data was unavailable. Many changes – both up and down – are modest. Year-to-year fluctuations are extremely common, and a spike or dip this year could go the opposite direction next year. That said, from a broader view, the report shows that murders are down and have been for years. Today’s murder rates are still at all-time historic lows. In 1990 there were 29.3 murders per 100,000 residents in these cities. In 2000, there were 13.8 murders per 100,000. Now, there are 9.9 murders per 100,000 residents. Averaged across the cities, we find that while Americans in urban areas have experienced more murders this year than last year, they are safer than they were five years ago and much safer than they were 25 years ago. It’s worth noting that cities that have seen increases, such as St. Louis, Milwaukee and New Orleans, are not in the analysis of 30 largest cities – they aren’t in that category – but they are included elsewhere in the report. The Brennan Center study also looked at crime rates, which in addition to murder measures non-negligent manslaughter, aggravated assault, robbery, burglary, larceny, and motor vehicle theft. While fewer cities provided general crime numbers, the report shows that crime rates are expected to drop in 11 of the 19 cities that could be measured. According to the report, the national crime rate is half of what it was in 1990. Philadelphia is expected to see a 2 percent decrease in homicides, according to the report, though an August New York Times article showed that it had six more homicides up to August 2015 compared with last year. The Brennan report projects nearly a 3 percent drop in the city’s crime rate. Both categories have dropped in Philadelphia by double-digits from five years ago, according to the report. Violent crime does not necessarily correlate to murder. Law enforcement officials point out that the difference between a homicide and a non-deadly shooting depends solely on where bullets fly – bad accuracy means fewer murders, but not necessarily less of a threat. All that said, increased murders in cities such as Baltimore and St. Louis are profoundly felt. The report does not give reasons for those increases, but does point to the acute poverty and unemployment in those cities. So, while several American communities are clearly hurting, the national survey shows a patchwork rather than any clear trend.